Minister Katherine Zappone revealed the controversy at a press conference yesterday. A WOMAN WHO was adopted illegally says the scandal is far more widespread than just St Patrick’s Guild and has asked why the issue is only emerging now when she has raised it with three separate children’s ministers and has campaigned about it for more than 10 years. Theresa Hiney Tinggal was 48-years-old when a family member told her that she was adopted. “It completely destroyed my life for some time,” the 64-year-old told TheJournal.ie. Despite her adoption being widespread knowledge within her family it is not acknowledged on her birth cert as her adoptive parents are listed as her biological parents. 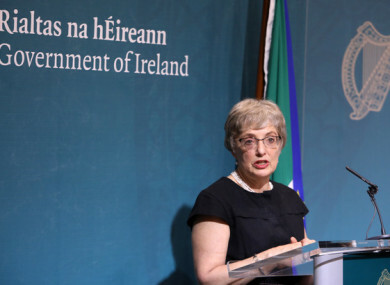 Yesterday Children’s Minister Katherine Zappone revealed that at least 126 people were incorrectly registered at birth between the years 1946 and 1969 by St Patrick’s Guild adoption society. Minister Zappone said that dozens of the people affected may not even know that they are adopted. She added that they have known about the practice of incorrect registrations for many years, but it has been extremely difficult to identify and prove in individual cases. Hiney Tinggal is not included in the figures because she was not adopted from the agency at the centre of the controversy. Her fellow campaigner Paul Redmond, who is chairperson of Adoption Rights Now, agrees that the practice was far more widespread than just St Patrick’s Guild. Redmond maintains that the Dublin society was just one of dozens that engaged in the practice. Speaking to Morning Ireland on RTÉ today the Chief Executive of the charity Barnardos, Fergus Finlay, went even further, saying he believes that every single adoption agency in the state was involved in illegal adoptions. The government has thrown those poor people to the wolves. Hiney Tinggal runs the Adopted illegally Ireland website which provides information to people who were adopted illegally. “Since I found out I’ve been completely ignored,” she said. “They have known for years and they’ve done absolutely nothing about it. I can’t believe what I’ve read today. They knew all about it. A lot of important people were involved and nobody did this out of the goodness of their hearts. It was all because of money. Theresa has campaigned for people who were adopted illegally for at least 10 years and in that time she says she has contacted three children’s ministers, Frances Fitzgerald, James Reilly and Katherine Zappone. After years of searching Hiney Tinggal eventually found her mother last year. Sadly the woman had passed away eight years earlier but she was able to find out about her history thanks to the woman’s family. Email “'It's been known for years': Adoption campaigners say scandal more widespread than St Patrick's Guild”. Feedback on “'It's been known for years': Adoption campaigners say scandal more widespread than St Patrick's Guild”.